All stadiums, teams, World Cup 2018 Mode player ratings, card packs, and FUT tweaks for FIFA 18 World Cup 2018. 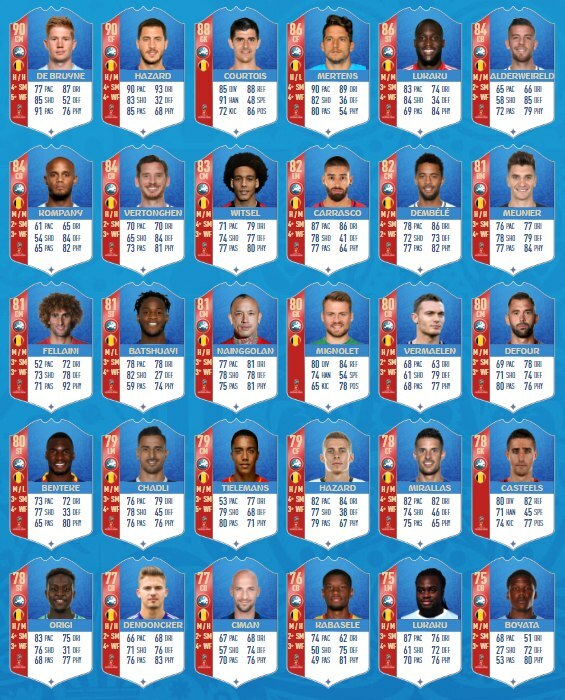 The World Cup 2018 Russia Update for FIFA 18 includes new player ratings for each player included in a squad featured in the World Cup (plus some squads for nations that didn't qualify). In this World Cup 2018 Belgium Squad Player Ratings guide we'll detail the Belgium squad in FIFA 18 World Cup and reveal their new ratings ahead of their World Cup semi-final. If you want to know who the best players in the Belgium squad are, we've got all the info you need. For more on FIFA 18 World Cup 2018 check out our FIFA 18 World Cup 2018 guide hub. We've got all the details on what the update brings to the game, plus how it's changing FUT for the World Cup mode. Read on for a listing of the entire Belgium squad included in the FIFA 18 World Cup 2018 update. As you can see, some of the Belgium players in the World Cup 2018 update have different overall ratings. While ratings for players like De Bruyne are significantly lower than they are for his in-form cards, players will be updated over the course of the World Cup should they perform well. That's our guide to the FIFA 18 World Cup 2018 Belgium squad. Check out our World Cup 2018 Ultimate Team guide to see how the mode is changing for the tournament. If you're looking for help with FIFA 19, we've got a full FIFA 19 guide. If you'd rather hop directly to one of our specific guides, we've got them all for you just below. Tagged with Guides,	world cup.